So many good Persona announcements, it's killing me with joy! Atlus has announced their pre-order perks for both Persona Q: Shadow of the Labyrinth and Persona 4 Arena Ultimax. Since Persona 4 Arena Ultimax's release date on Amazon is September 30th and Persona Q's is November 30th (don't get too excited - they're still place holder dates, not real dates), let's start with Persona 4 Arena Ultimax's perks! 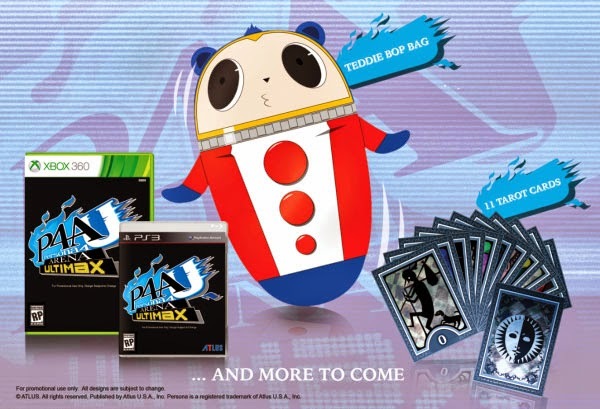 If you pre-order Persona 4 Arena Ultimax from these listed retailers (including Amazon), you will receive the game on whichever platform you choose and also a Teddie Bop Bag and the first set of 11 Tarot Cards (you'll hear about the second set in a minute). If you're a Persona player, you'll instantly recognise the cards - they are the Arcana cards from the game. Atlus also teases that there is more to come. I wonder a) what else they're going to include and b) if it will be included in the standard edition! 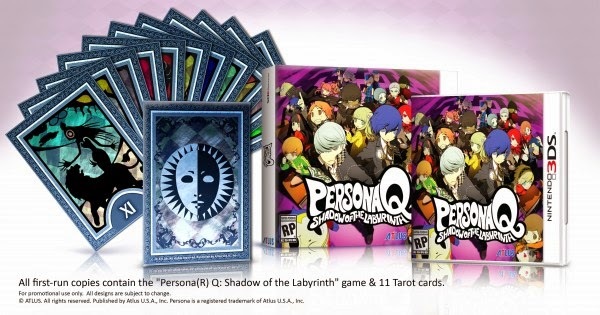 If you pre-order or buy a first print copy of Persona Q for 3DS (retailers haven't been officially listed, but you can pre-order from Amazon), you will receive the game in special packaging and the second set of 11 tarot cards. This means if you want the full set of tarot cards, you will need to pre-order both Persona 4 Arena Ultimax and Persona Q. 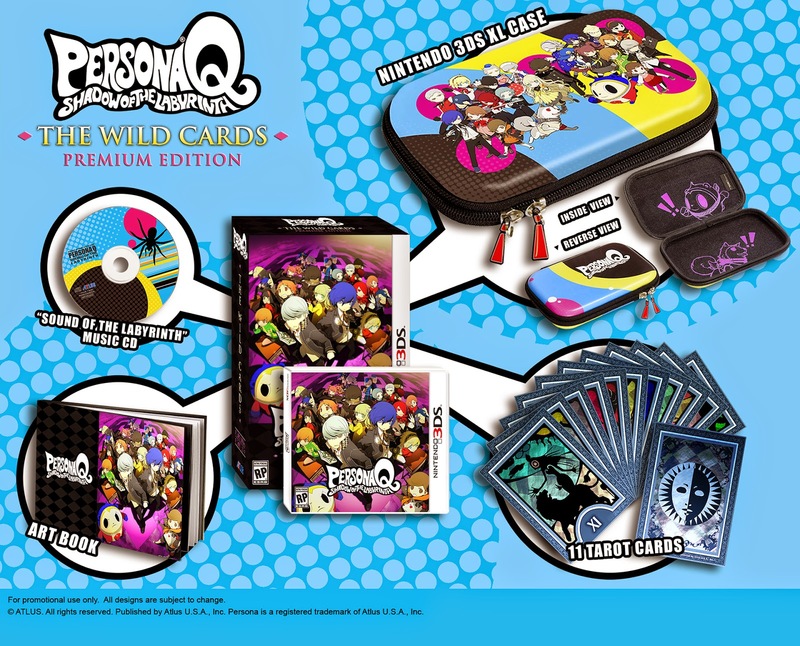 As you can see in the photo, the Wild Cards edition includes the game, special packaging, the 'Sound of the Labyrinth' Music CD, Nintendo 3DS XL Case (which you can actually buy separately from Play-Asia), a Persona Q Artbook and the second set of Tarot Cards. Wow. And in true 'Atlus, shut up and take my money' spirit, I just pre-ordered the Persona Q Premium Edition to go with my Persona 4 Arena Ultimax pre-order. Please note - I haven't even bought my 3DS yet. My god. Congratulations are also in order for Atlus - Persona Q debuted at number one in the gaming charts in Japan. And for European readers, Persona Q has finally been announced for European release. An all round good time for Persona fans right now! You can pre-order Persona 4 Arena Ultimax, Persona Q: Shadow of the Labyrinth Standard Edition and Wild Cards Premium Edition at Amazon.